We had no idea that the critically endangered dryas monkey, existed in the TL2 watersheds until, in 2014, Henri saw a hunter’s kill hung for sale near our Bafundo camp, in the Balanga village of Bafundo. He knew the monkey was different from any he had seen before. John suspected it was the dryas monkey, though 400 km from the only place where it was known to exist. A couple hunters gave it the name, Inoko, but most local hunters did not even recognize it. Pablo snapped this photo of C. dryas soon after he started working with Daniel on the Inoko Project. 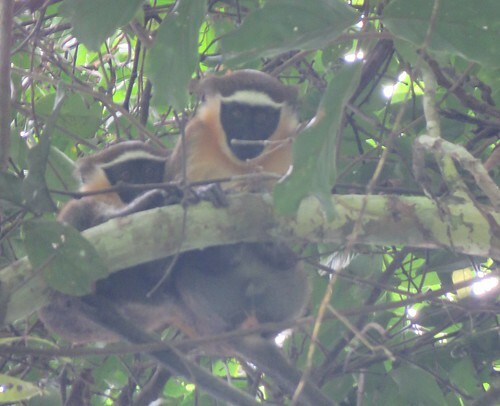 An exchange of photos over the internet confirmed that it was indeed dryas monkey, without any obvious physical difference from the Wamba-Kokolopori monkeys. But why didn’t the Balanga hunters know about it? Was it so very rare, or was it just very secretive? The TL2 team based at Bafundo started a search with an eventual second sighting farther west, inside the park. Maybe it is fairly widespread, but extremely elusive? We found it well below the canopy. Is it a ground monkey? 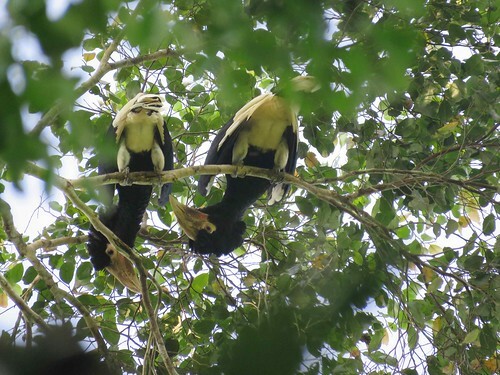 Or a canopy monkey that comes low to forage? What is its favored habitat? What does it eat? 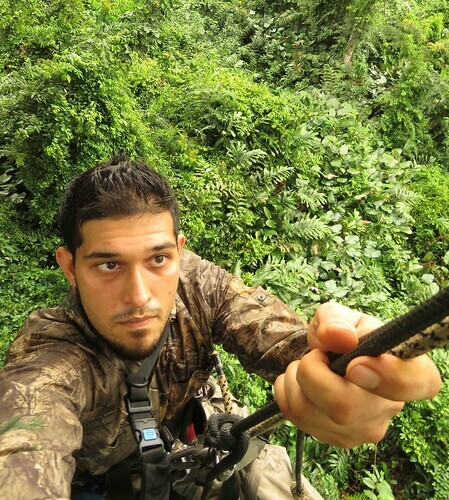 Daniel is often setting camera traps or checking them at 20 or 30m up, in the crowns of trees. Daniel Aliempijevic, a graduate student at Florida Atlantic University, came over to investigate. If he could collect Inoko feces, he and his professor, Kate Detwiler, could do genetic studies. Her work had earlier contributed to the discovery of TL2’s new primate species, Lesula, Cercopithecus lomamiensis. Daniel on his way to work…. Daniel set out to discover where Inoko was and how to find it. His team was composed mainly of local Balanga: the hunter who had bagged the original Inoko, Reddy; the deputy to the chief of Bafundo, Denni; and two Balanga that were already with our TL2 project, JP and Marten. 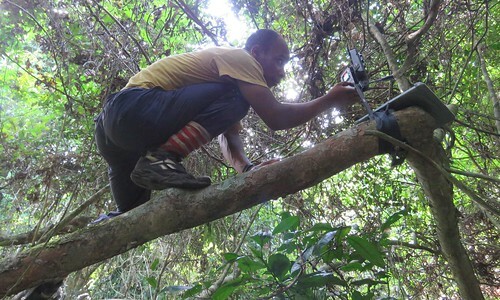 He also worked with out TL2 leader, Pablo, from an adjacent province, who is university educated and has a good deal of experience working with camera traps from the Lesula work. 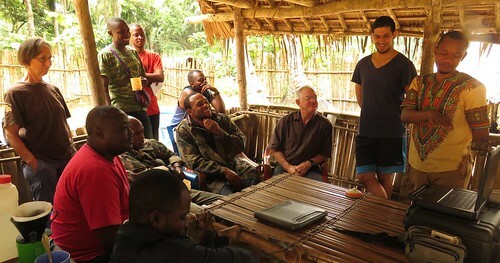 Daniel and Pablo (far right) at Bafundo explaining to us the progress and problems of the first phase of the Inoko project. The first site Daniel chose was just four km from the village of Bafundo. 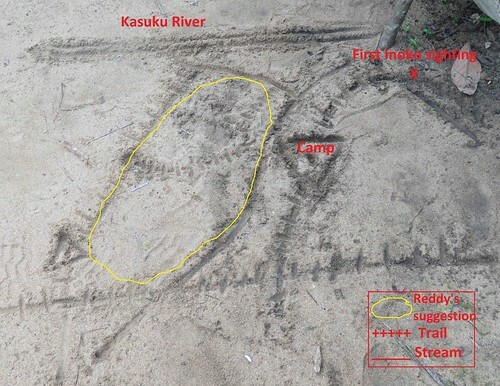 This was the dense area of vegetation where Reddy had previously caught Inoko. 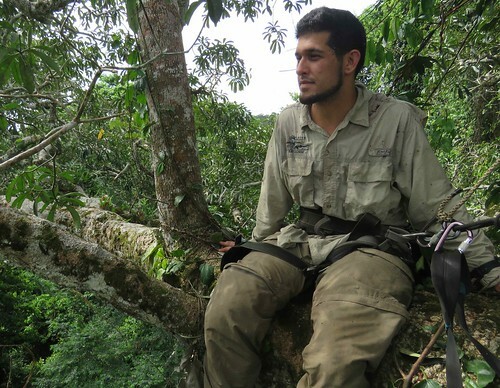 Daniel wanted to set camera traps at three levels: the ground, the understory with a good density of lianas, and the high canopy where horizontal branches let animals cross from one tree to another. Reddy drew a map in the sand to show where he had seen Inoko. That is where the project started. Daniel starts by demonstrating the equipment to Pablo (striped shirt) and JP (blue shirt). Kinois, the team leader at Bafundo camp watches. Cintia Garai, the TL2 project assistant, came to take some photos and learn the ropes. 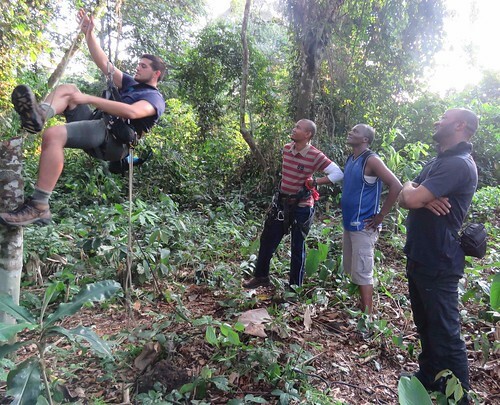 Unlike the Botanical work where we brought in Mbuti climbers, Daniel was the most experienced climber on his team, although, unlike the Mbuti, he used climbing gear. He, himself, set the cameras high in the canopy, but the others helped to set them in the understory and close to the ground. Reddy checks a camera in the understory. We were amazed that so near to hunters’ villages there would still be the diversity of game at ground level, including some large mammals. We had only guessed at the diversity of animals in the canopy. His cameras showed that treetops were not just for monkeys by a long shot. 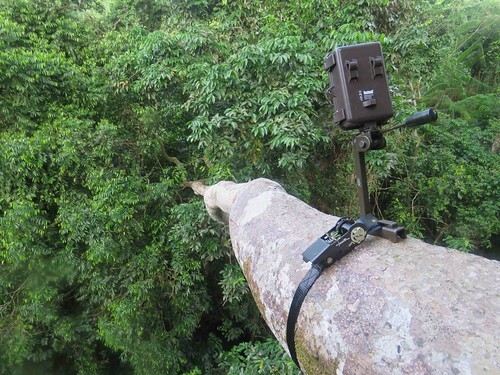 A camera-trap in the canopy typically had a view over a horizontal branch connecting to another tree. But the crowning achievement for Daniel (and for us) was the understory videos he captured of Inoko. All Bafundo videos of Inoko were in liana layers of the understory. They were never captured high and never on the ground. Daniel has now moved the cameras away from the village and into the park itself. Again working in step-wise settings, moving up a tree, with one camera at ground level, one in the understory and one in the canopy. Each rigged tree is a column for observation. There will be many more surprises and, hopefully, lots more information about Inoko. For TL2/Lukuru funders see the side bar. This entry was written by Terese Hart, posted on 2017-01-25 at 4:24 pm, filed under Mystery monkeys, Natural History of TL2. Bookmark the permalink. Follow any comments here with the RSS feed for this post. Trackbacks are closed, but you can post a comment. 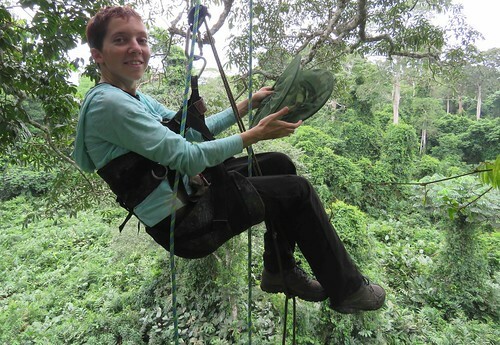 Thanks for getting this together Terese and Cintia, I can’t wait to see what videos await us in the canopy in the park! Those are some amazing shots! Great work, everybody.